← City Camp Chelmsford is coming – book now! Registered voters for the Chelmsford Grand Awards received an email today, introducing CityCamp Chelmsford and inviting them to come along and join in. The email is reproduced below and the best part is that it confirms that Chelmsford City Council is contributing a special Grand Award of up to £1000 especially for the best ideas pitched at City Camp. Chelmsford Grand Awards is an awards scheme for local voluntary and community groups active in the borough of Chelmsford. It was created to recognise and support the many small groups doing big things in the community. £1000 is awarded each month to the group which receives the highest number of votes. Chelmsford Boys Club – minibus driver to get boys to dodgeball events. 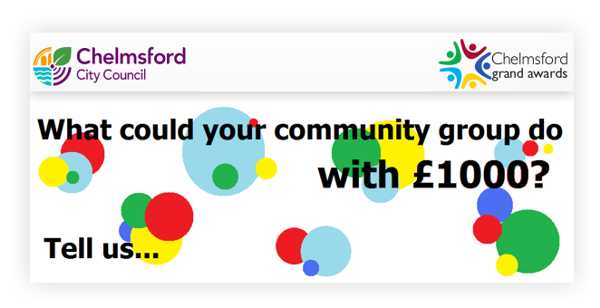 Thank you for taking the time to support local community groups in Chelmsford by voting in Chelmsford City Council’s Grand Award scheme in the last year. The scheme has already helped community projects, from disability support networks to sports clubs and Jubilee parties within the Chelmsford area. As someone who has voted in the Grand Awards, you may be a member of a Chelmsford club or charity or know people who are. We are sending you this email to tell you about an exciting opportunity for our community groups and an opportunity to apply for a special grand award. To celebrate its new City status, Chelmsford is hosting its first ever CityCamp, a unique blend of conference and workshop designed to help people in Chelmsford develop ideas abut how we can make the best use of technology to support our city and its community groups. The event takes place on 7th – 8th of September at Anglia Ruskin University. Friday will host discussions and panel debates around the future of Chelmsford and the opportunities that improved Internet connectivity and services it will bring. Saturday will be where you can ask for help, pitch your ideas and come up with ways to transform your organisation, improve how you interact with the public or to volunteer your time to support an idea. Any ideas are welcome; examples from other events include a charity wanting to develop their web site or a suggestion for a community safety mobile app. There will be awards for the best ideas as judged by a panel, and Chelmsford City Council is contributing a special Grand Award of up to £1000. So if you have any ideas about how to use technology or would like some support in getting your group, club or charity an online or social media presence, we do hope you will join us at CityCamp.